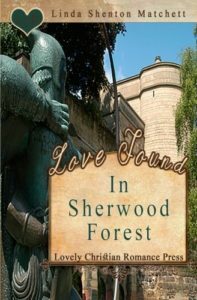 Love Found In Sherwood Forest by Linda Shenton Matchett is a contemporary Christian romance with God at the centre. God should be the focus of our lives. The novel explores what happens when you hand the driving seat of your life over to God. “It’s all about Him, not me.” God’s plans are so much greater than our own. When we try to rush Him or put ourselves above Him, life can be puzzling and a struggle. “We need to trust Him and take one day at a time.” God gives us just enough light for the step we are on. We do not need to worry about tomorrow. God’s got tomorrow covered. Do we trust Him? It is important to pray about everything. Prayer is communicating with God. We need to pray until we get the peace that only God can give. The novel has the theme of love. Sometimes love means letting go. Sometimes love means hanging on. Love as described in 1 Corinthians: 13 is what we should all strive to practice. Family is another important theme. Families stick together and help each other. The Nottingham theatre group is like family. They pull together and encourage each other to bring out the best in everyone. There is the theme of healing. There is both physical and mental healing. “She’s hurting and God is the only one who can heal her.” We need to let the doctors work in partnership with God, the great physician. What makes us happy? “Happiness isn’t about success.” Success will not make us happy. Each success will be followed by another chasing of something. Being who God created us to be will bring peace and contentment and happiness. As the novel was set in England, it was lovely to be able to picture the locations mentioned. I really enjoyed Love Found In Sherwood Forest. It was a feel good read, just perfect for a dull grey day. Enter to win a signed copy and $10 Amazon gift card.